In The Long View, Brian Fetherstonhaugh, CEO of OgilvyOne Worldwide, details the three distinct but interconnected stages of a career, and how we build ‘fuel’ at every step along the way to create long-term success. The Long View teaches new ways of finding jobs, new methods to build careers that last, and a new definition of “work” that embraces life-satisfaction and happiness. With insights drawn from interviews with a variety of professionals who share both success stories and cautionary tales, The Long View will help you establish your own path for overcoming obstacles and making the best choices for a long, accomplished, and rewarding career. How long is the average career? Surprisingly, few of us are able to reply without giving it some thought. The reason, as OgilvyOne Worldwide Chairman and CEO Brian Fetherstonhaugh argues in his book The Long View: Career Strategies to Start Strong, Reach High and Go Far, most people think of their careers only in terms of the next step. Perhaps they have a vague view of what ultimate success might look like, but mostly people are focused on getting that job, or — if younger — getting that degree. According to Fetherstonhaugh, the best way to create a successful career is to have a long view from the very beginning. A career is not a series of sprints; it is a marathon that, as with any marathon, must be carefully thought through. According to Fetherstonhaugh, the average career is 45 years, which he breaks down into three stages of 15 years each. Stage One is the “start strong” stage in which people lay the solid foundation for a long career. During these first 15 years of a career, Fetherstonhaugh advises his readers to work hard at addressing and overcoming any weaknesses or gaps that can undermine their long-term success. He also suggests that people in this stage choose a few topics to become an expert in, learn to seek honest feedback and build their presence, for example on social media. Stage Two is the sweet-spot “reaching high” stage, when people stand out from the pack and do what they love to do — and what the world needs. Covering year 15 to year 30 of a career, the goal of Stage Two is to convert the groundwork from Stage One into meaningful rewards, Fetherstonhaugh writes. Aligning passions and core strengths — focus on strengths not weaknesses at this stage, he advises — and increasing the impact of a career are two of the pillars of Stage Two. Some might think of the lasting-impact, “going far” Stage Three of a career as the pinnacle: reaching the top of the climb. For Fetherstonhaugh, however, Stage Three — the last 15 years of a career — is actually a new beginning. For certain people, this may mean leveraging their success into a new career. Fetherstonhaugh offers the example of Tim Penner, who spent 30 years with Procter & Gamble, eventually becoming President of P&G Canada. Penner is now a business advisor to companies and, especially, non-profits. Entrepreneurship is another avenue: As they leave their companies, Stage Three careerists start the little company they’ve always dreamed of — or were just inspired to start. Transportable Skills. These are the basic skills that Fetherstonhaugh says will make people successful in every job they have. These include such skills as problem-solving, effective communication, getting things done, knowing how to give and ask for help, and emotional intelligence. Meaningful Experiences. Especially during the first 15 years of a career, workers should also be accumulating a series of diverse experiences that will contribute to their success. 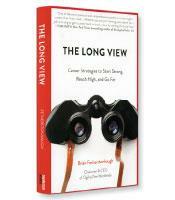 The Long View is filled with strategies and practical tools to help readers develop and implement a career plan. Multiple examples and case studies further enrich this unique guide, as do exceptional chapters on careers and parenthood, going global and overcoming adversity. 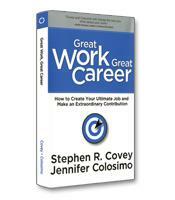 Anyone at any stage of his or her career will find new inspiration to take charge of their careers.